Torpedoes are small 3/4" paper balls that explode and make a cloud of smoke when thrown on the ground. friction or impact. Any accidental friction or impact to this composition will instantly cause an explosion. The amount mixed at one time should never exceed 20 grams total. The utmost care and diligence is required if this composition is made. and the kid's leg has a chunk blown out of it. In short, never carry Torpedoes on your person, or in a metal or glass container. but did explode when thrown onto concrete. Generally they will not explode when thrown onto grass or dirt. Torpedoes were the actual names for these devices, but many people also call them "Cracker Balls"
which were actually much smaller devices (about 1/4" in diameter) sold in the 1960s. In addition to the chemicals listed on the second page, you will also need some 3/4" paper cup sets, a Torpedo Board, and some uncoated, medium size Aquarium Gravel. 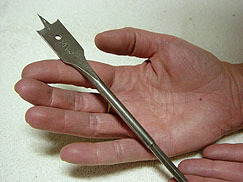 The gravel pieces should be no more than 1/8". You may have to sift the gravel through a screen to get the proper size. 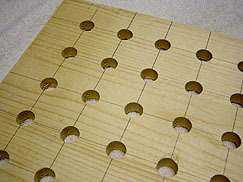 A Torpedo Board is easy to make and is also used to make Cherry Bombs, Smoke Balls, or any firework composition that is contained in 3/4" paper cup sets. 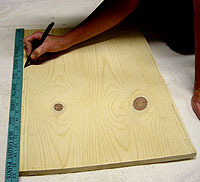 Pick any 1/2" thick piece of wood, Plywood, Solid Pine, or whatever wood turns you on. About 1' x 2' is a nice size, but it can be any size you want. 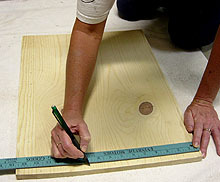 Make a marks every 2", both horizontally and vertically. 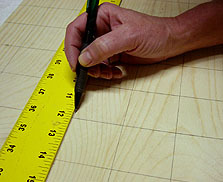 Draw lines connecting the marks so you've got a 2" square grid pattern. 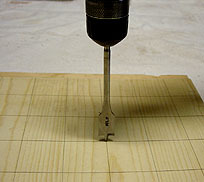 Go find or buy a 3/4" wood bit for your drill. 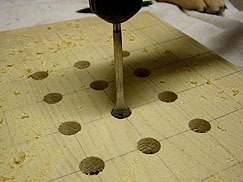 Drill a 3/4" hole at every line intersection all the way through the board. Ta-Da... you've made a Torpedo Board.